The Bedouins (/ˈbɛdᵿ.ɪn/; Arabic: بَدَوِي badawī) are an Arab semi nomadic group, descended from nomads who have historically inhabited the Arabian and Syrian deserts. 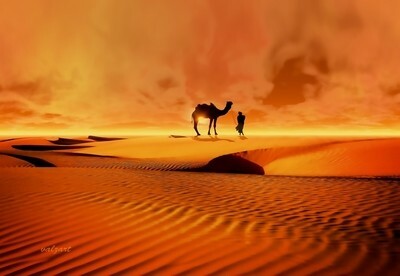 Their name means "desert dwellers" in Arabic language. While many Bedouins have abandoned their nomadic and tribal traditions for modern urban lifestyle, they retain traditional Bedouin culture with concepts of belonging to ʿašāʾir, traditional music, poetry, dances (like Saas), and many other cultural practices. This is your most viewed photo by your peers. We have awarded this photo with the Members Selection Award.